Stockholm is the capital and largest city in Sweden with almost two million people in the greater metropolitan area. The inner city is made up of 14 islands that are connected by about 50 different bridges. Stockholm is a cosmopolitan city with a lot of beauty and character. Most visitors like to stay in or near the city's Old Town, or Gamla Stan. There are many great hostels around Stockholm. If you're looking for an affordable and relaxing place to stay, some great options are listed below. How much do hostels in Stockholm cost? A good hostel for backpackers, families, couples, and groups of friends. Castanea Old Town Hostel is a centrally located hostel in Stockholm's Old Town. It's an award winning hostel that has a cozy atmosphere and a relaxing and quiet setting. The hostel is relatively small, so the staff can focus on the personal touches. The building dates back to 1747 and is historic and charming. If you want to be close to everything, but still in a quiet and peaceful part of the city, then this is the hostel to stay at. The hostel has both dorms and private rooms to choose from. There are single, twin, four bed, and six bed private rooms. The dorms sleep four, six, or sixteen people. Each room has large windows that let in a lot of natural light. The beds are comfortable and each dorm bed has its own reading light. The hostel also has a guest kitchen where you can prepare food. There is a common room, a public computer, and wi-fi in the common areas. If you want to stay in a hostel that appeals to all types of travelers, then Castanea Old Town Hostel is a great option. A good hostel for backpackers and female travellers. City Hostel Central Station is another great option for budget travelers and backpackers. 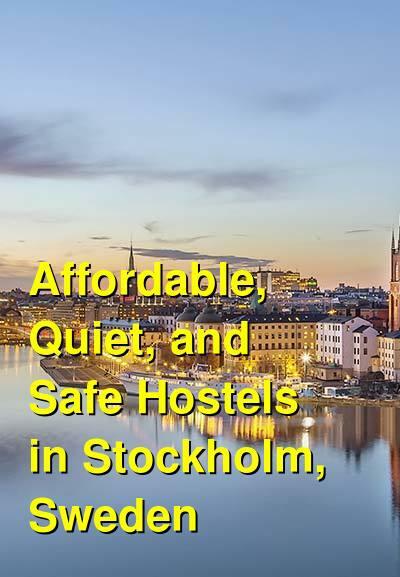 The hostel is about half a kilometer from the airport buses and the Stockholm Central Station. It's easily accessible with most types of public transit and makes a convenient base during your time in the city. The hostel is clean and welcoming and the staff and friendly and helpful. There is space for up to 79 people in a variety of different room types. The private room options include singles, twins, and three or four bed rooms. Dorms sleep six, eight, ten, or twelve people and both co-ed and female only rooms are available. Every private room has cable television and free wi-fi. There's also a tv and public computer in the common area. The kitchen has a stove, oven, microwave, refrigerator, and toasters. This is another fun and affordable place to stay that has a quiet environment where you can be assured a good nights sleep. A good hostel for backpackers and small groups. Crafoord Place in Stockholm is a small and friendly hostel that is perfect for budget travelers who want a personal and cozy place to stay. There are only nine rooms in the hostel and 43 beds in total. The rooms include three and four bed private rooms as well as six and ten bed dorms. Whatever your budget or travel style, this is a good place to stay. The hostel also has free wi-fi throughout and a small common room where you can watch movies with other guests. Crafoord Place is about twelve minutes from the City Terminal where the airport buses drop off and pick up. It's also near many popular shopping areas and tourist areas. There's a large supermarket just around the corner and everything you might need is nearby. A good hostel for backpackers, couples, and small groups. Hostel Dalagatan is located near Vasaparken Park in central Stockholm. It's about a five minute walk from the Odenplan Metro Station and is a convenient place to stay. It's also about half a kilometer from Drottninggatan shopping street and fifteen minutes from Stockholm Central Station. The rooms are comfortable and well furnished. They are brightly colored and there is a friendly atmosphere throughout the building. The hostel has private twin, double, and four bed rooms as well as eight bed dorms. This is a clean and comfortable hostel with friendly staff and a relaxing setting. All of the rooms are soundproofed so they remain quiet through the night.